We have used the services of Office and Industrial Specialists since 2007, and we could not be more satisfied with their work. There are not enough adjectives in the English language to describe how pleased we are with the work that they do. They have proven to be responsive, professional, courteous, efficient, reliable, dependable, etc., etc. I highly recommend them to all in need of office relocation and installation services! I have worked with Bruce Cochran and his company for years. They by far exceed any other moving company I have worked with. OIS strives to be the best company around and they do so, by being professional, courteous and saying no job is ever too small or too big. We have some pretty large moves in our office and the attorneys and staff are always pleased with the smooth transition and the timely manner which the moves are handled. Our firm began doing business with Office and Industrial Specialists when we opened. Since then, Bruce Cochran and his company have not only handled all of our office moves, but also office furniture purchases, office supplies purchases, furniture repairs, off-site storage and our shredding needs. In short, Bruce has become our "go-to" man for everything! He and his employees are professional, courteous, hard working, friendly and always conscious of being in a law office while getting their jobs done. I give Bruce and OIS the highest recommendation possible. Office and Industrial Specialists has provided relocation and installation services for Norton Physician Services for many years. 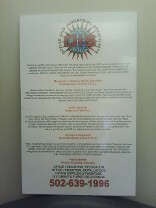 OIS offers a professional service and delivers a wide variety of products. They are very reliable and most importantly flexible when working within a health care environment. The OIS staff is energized and motivated and always puts the "customer first". Even when complex issues and situations arise, they always maintain a "can-do" approach.